A plain or rounded rim, which usually lacks a neck, small thick loop handles and a small tapered body, normally covered with horizontal rilling. However, there are a number of variations on this shape. Martin-Kilcher initially distinguished two variants (1994: Abb. 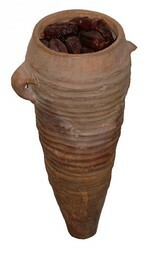 196, 1.2), while Vipard’s (1995) study shows that the typology of the carrot amphora is rather heterogeneous, including vessels of different sizes, rim diameters, tapered bodies and hollow spikes. Vipard ‘s (1995: 52-4) basic classification has three shapes: A - rounded body with conical outline; B - rounded body which narrows below the handles, having a sharper conical bottom; C - oblong short body and a variety of rims: 1 - turned down; 2 -vertical; 3 - everted. Early first century AD at Wiesbaden and Vindonissa, common at Claudian Hofheim (Reusch, 1970) and Claudian-Neronian Colchester (Hawkes & Hull, 1947). They are found after AD 75 at Fishbourne (Cunliffe, 1971) and late first century AD to early second century from Barcelona (Carreras Monfort & Williams, 2002). If the three handle fragments of Type 85 at Oberaden are in fact from vessels of this type, the initial date for its appearance might be the last decade of the first century BC (Loeschcke, 1942). Tomlin's (1992) argument for an Egyptian origin was based on an inscription from Carlisle which seems to mention dates from the Thebaid. However, the carrot amphora has not been found in Egypt and its fabric is quite unlike locally made amphorae (Tomber & Williams, 2000). Carrot amphorae are said to have been made in Beirut (Hayes, 1997; Reynolds, 2000a), though it is not entirely clear if these vessels are indeed of this form or something similar. Carreras Monfort & Williams (2002) suggest Palestine but the dearth of finds from this area is curious. It seems that the manufacturing centre directed most of its produce to the north-western parts of the empire. It is commonly associated with early military sites in Britain, Germany, and Pannonia (Reusch, 1970; Carreras Monfort & Williams, 2002), but other examples occur in Gaul, Spain and Italy (Carreras Monfort & Williams, 2002). Unknown, but possibly dates (Reusch, 1970; Carreras Monfort & Williams, 2002). Small vessels of comparable, but not identical form, are shown in wall paintings at Herculaneum, and these could have been containers for dates as they are associated with fruit (Loeschcke, 1942: Fig. 29).